Last week, we headed up to the National Gallery in Ottawa to view the Canada 150 exhibition. 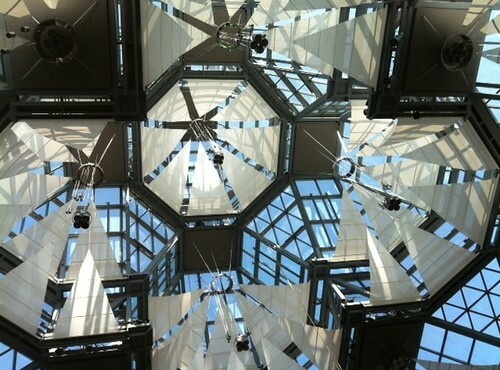 The building itself is always a highlight of any visit to the Gallery. 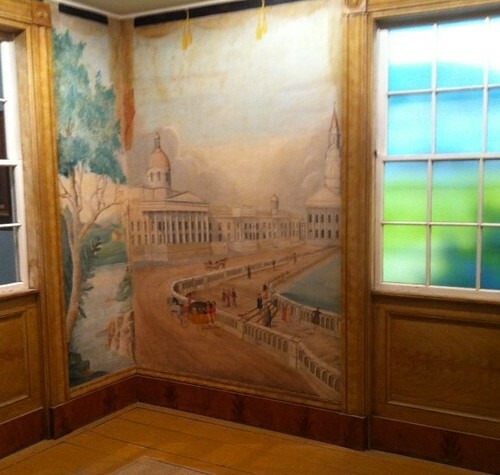 The exhibit was surprisingly low-key, with minimal interpretation offered to visitors. On view were a combination of historic paintings, a bit of sculpture, and a selection of indigenous relics and art work. Many of the paintings were well-known old favorites and I thought I’d offer a sampling here. 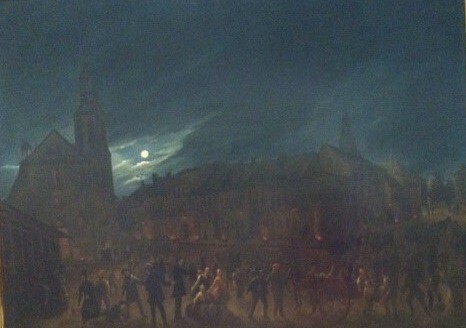 This dramatic night scene is Cholera Plague, Quebec, by Joseph Legare, 1832. 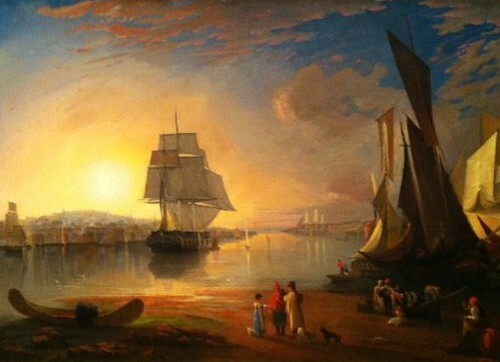 In sharp contrast is this serene sunset, The Port of Halifax, 1835. It is attributed to John Poad Drake, but is likely by another unknown hand. and this view of London. Cornelius Krieghoff, who specialized in scenes of habitant life, must be one of the best-known 19th-century Canadian painters. His scenes are still appealing. 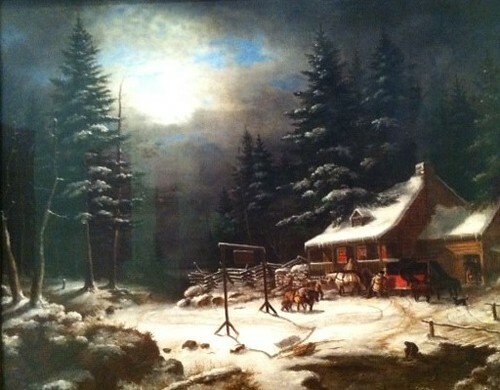 This is White Horse Inn by Moonlight, 1851. Robert Duncanson was an African-American landscape painter of the Hudson School who moved north during the American Civil War. This is Owl’s Head Mountain, 1864. 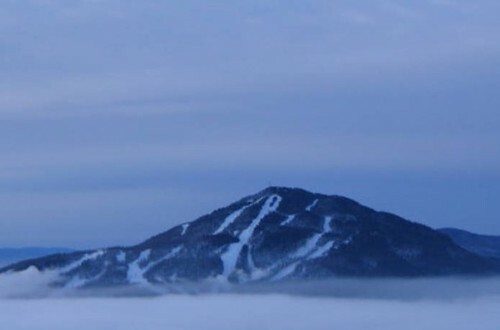 I looked up Owl’s Head Mountain later and found this photograph of the mountain as it appears now, festooned with ski runs. Niagara Falls has long been a favorite subject. 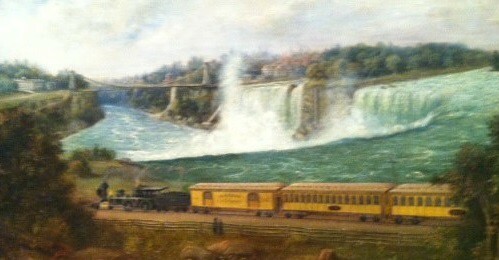 This painting by Robert R Whale (attributed) was likely completed as part of a project for the Canada Southern Railway. 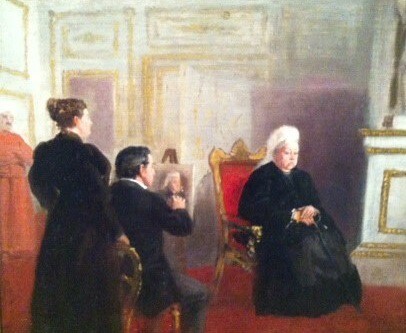 I smiled at this 1895 self-portrait by Frederic M. Bell-Smith, in which he portrays himself painting a rather grumpy-looking Queen Victoria. Artist Laura Muntz Lyall is best known for her painting titled Interesting Story, featuring two children reading together. However, this portrait, titled A Daffodil, 1910, is typical of the many sweet portraits she painted of children and women in a loose, impressionistic style. 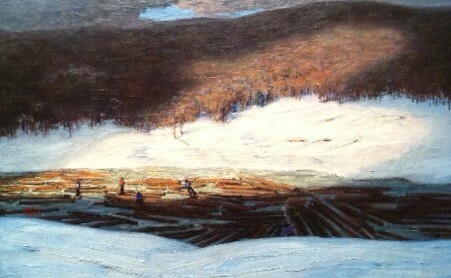 I liked this early Lawren Harris work titled The Drive. It captures the broad timbered landscape that men once thought was inexhaustible, and some of the men who stripped much of the forest from the eastern continent. 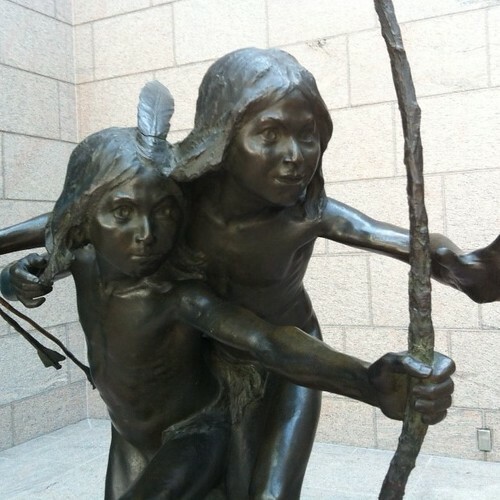 Alfred Laliberte was a talented Québécois sculptor who completed this bronze, Young Indians Hunting, while living in Paris, about 1905. Such works are criticized as presenting a clichéd representation of indigenous peoples to a European audience. However, the intensity and sheer joy of these two boys is impossible to dismiss. It was a pleasure to see J.E.H. 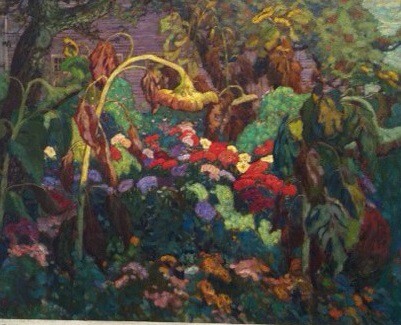 MacDonald’s The Tangled Garden. 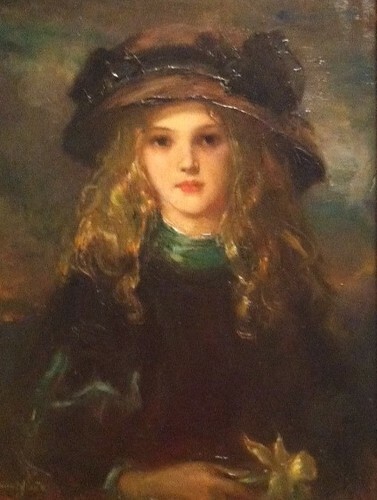 Although a popular image now, the painting was controversial in 1916. It always reminds me of my own fall garden. 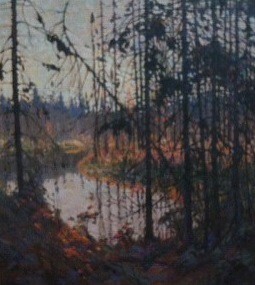 Tom Thomson’s Northern River, painted in 1914-15, is among the most iconic of Group of Seven paintings. Canadians might be excused for thinking that only the men of the Group of Seven produced creative, adventurous paintings in the early years of the 20th century, but it wasn’t so. 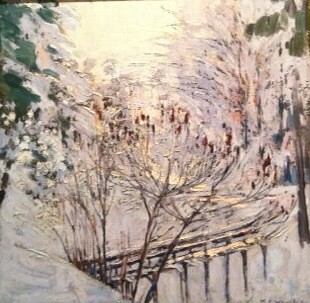 This marvellous, sparkling, movemented snow scene was painted by Mary Wrinch in 1918. It is titled Snow Magic. 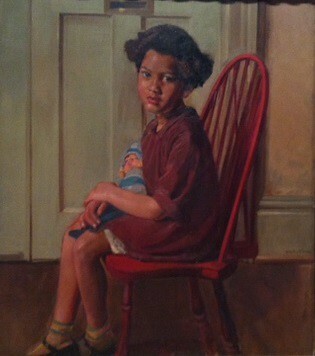 I liked this lively portrait of Amy, painted by Dorothy Stevens in 1930. Stevens was an active Toronto artist who, among other accomplishments, became president of the Toronto-based Women’s Art Association. 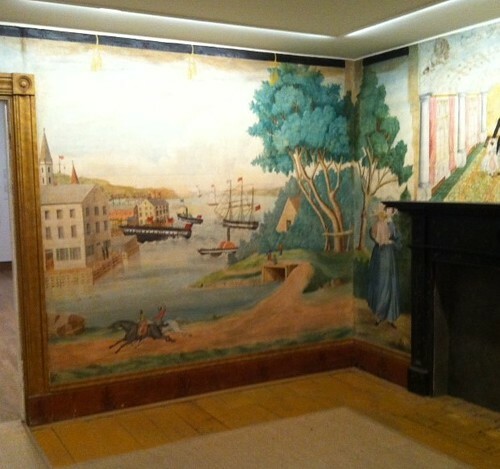 Women artists were also making a place for themselves in Montreal. 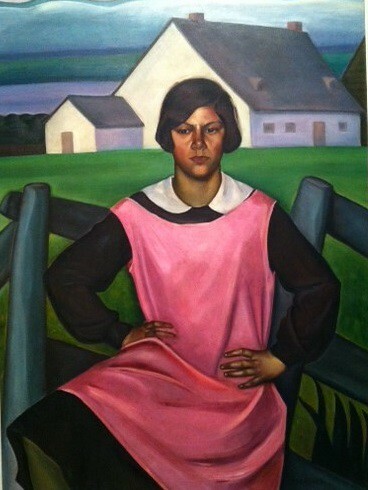 This powerful portrait of Rollande was painted by Prudence Heward in 1929. Heward was a member of the Beaver Hall Group, which, unlike the Group of Seven, included both men and women. 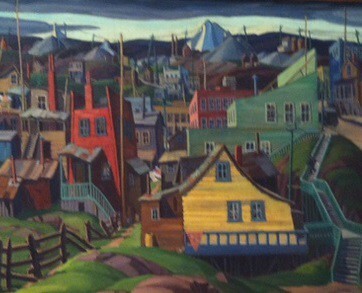 Yvonne M. Housser painted the town of Cobalt in 1931. The town grew up without planning along erratically curving streets after silver was discovered in the area in 1903 and miners and fortune hunters flooded into the area. By the 1930s, silver mining activity was in decline. 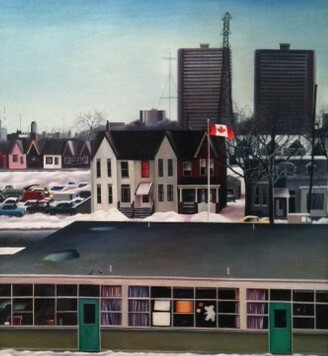 More than 35 years later, Christine Pflug painted the view outside her Birch Avenue, Toronto, apartment: Cottingham School in Winter 1968. The square angles make an interesting contrast to the higgledy-piggledy layout of Cobalt. 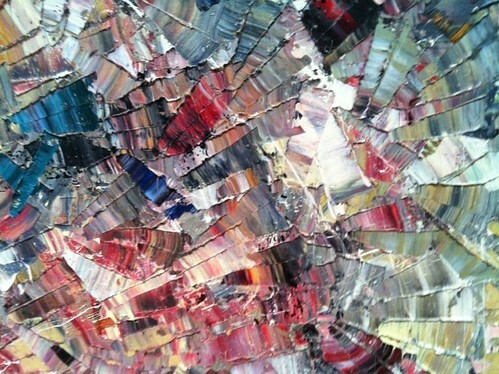 By the 1950s, Canadian artists were experimenting with abstraction. 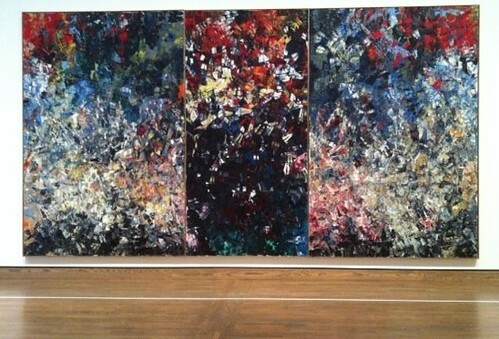 This is Jean Paul Riopelle’s 1954 monumental triptych, Pavane. 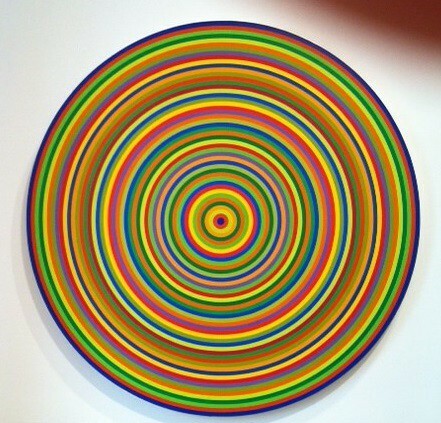 Painted a year earlier than Christine Pflug’s cityscape, Claude Tousignant’s Chromatic Accelerator of 1967 offers a strong optical experience as the colours spin together the longer you stare. Aboriginal Canadian artist Norval Morrisseau adapted abstraction to create powerful interpretations of native culture and myth. 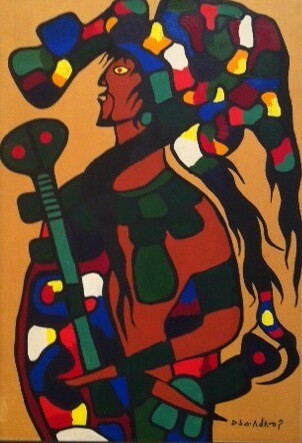 Untitled (Shaman) was painted in 1971. In the 21st century, it seems that anything goes. The process by which art finds its way into galleries is mysterious, but curatorial taste seems to favour the grotesque and the too-clever-for-words. Our three daughters and their partners were all able to attend our Thanksgiving weekend get-together this year and we enjoyed their company from Friday night through Sunday. 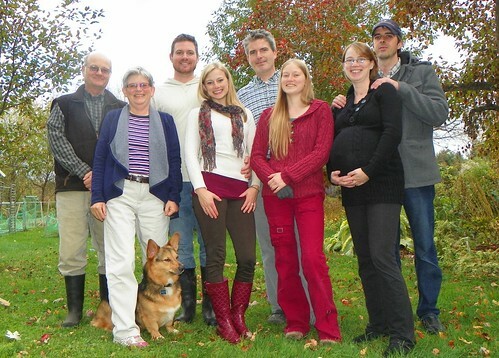 Here we are, assembled for a group portrait on Saturday afternoon. We had the traditional Thanksgiving dinner of turkey, potatoes, Brussels sprouts and rutabaga, with pumpkin and grape pies for dessert. 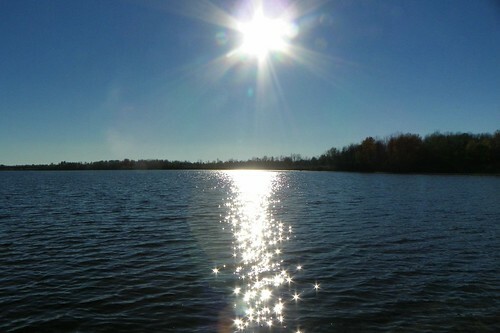 It has been a perfect fall weekend, with brisk, bright, sunny weather to set off the pleasure of spending time together. Once all our visitors headed for home on Sunday afternoon, the house felt quiet and empty. We decided to take Pookie the corgi for a walk at Baxter Conservation Area to top off the weekend and soak up some more sun on this perfect fall day. 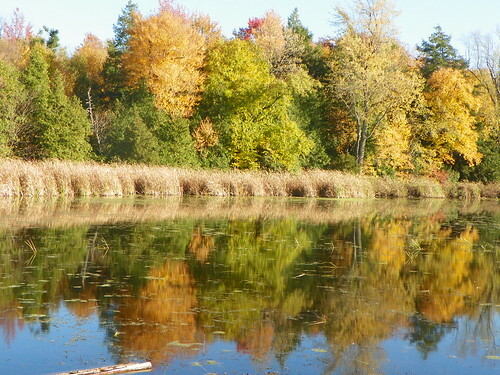 Baxter Conservation Area is located along the Rideau River, just north and east of the town of Kemptville, Ontario. 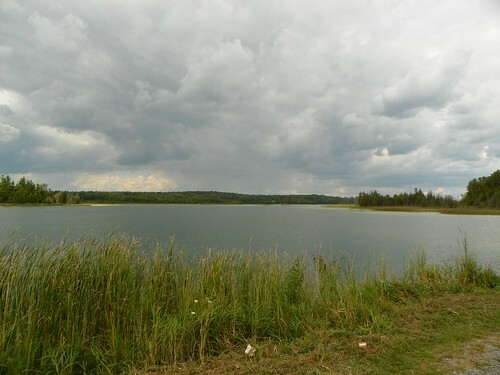 The 68 hectare site offers five kilometers of trails through forest and wetland and peaceful views of the Rideau River. It was a lovely spot to appreciate the last of the autumn leaves, now past their height and beginning to fall from the trees, but still colourful. A boardwalk and elevated lookout viewing stand allow a closeup look at the marsh and wetlands. 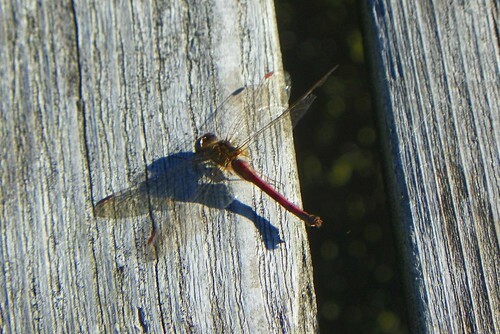 The park was quiet, with just a few late-flying meadowhawk dragonflies to be seen. The walk was a perfect a way to wind down from a busy weekend, for both us and the dog! I hope you have been enjoying a pleasant Thanksgiving or Columbus day weekend too. 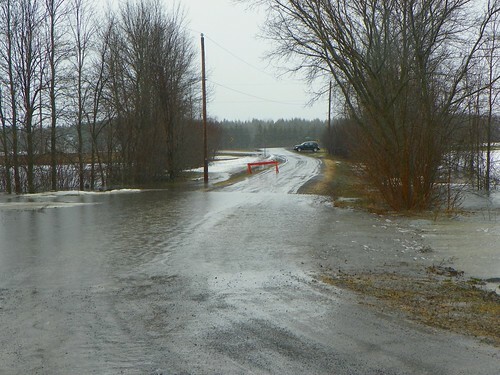 The road to Willow House crosses our little river before turning sharply left and following the riverbank to the house. The river, the headwaters of the South Nation River, is usually little more than a creek, but it responds rapidly to increased inflow from rain or snowmelt. The year before we moved to Willow House, the culverts that carry the stream beneath the road were all replaced with larger and more numberous culverts. The new culverts have always been sufficient to contain the stream’s most active flow. That all changed on Tuesday. With a few mild days, our extensive snow cover has been melting rapidly, and on Monday night a heavy rain supplemented the snowmelt. 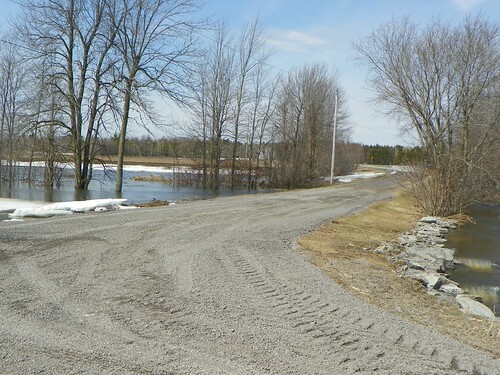 The engorged river overwhelmed the culverts and began creeping across the road. RailGuy moved a vehicle to the far side of the bridge so that we wouldn’t be trapped, and then we watched with fascination as the river continued to rise across the day. 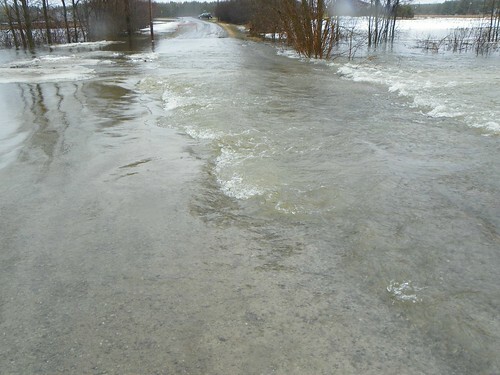 The water never exceeded 6 or 8 inches in depth over the road, and we were able to walk to the other side, but the power of the flow was impressive. 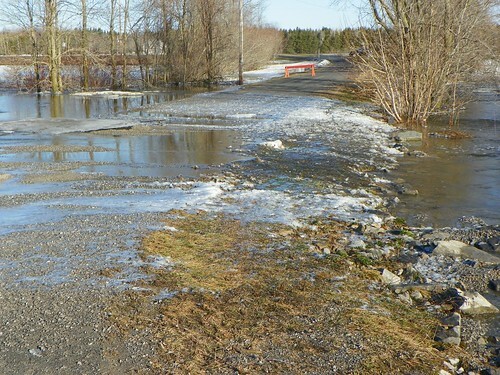 The current soon began to erode the gravel on the roadway. 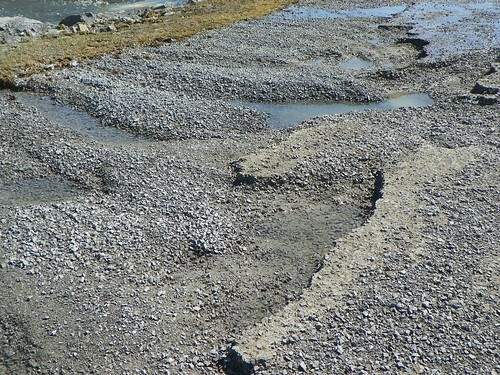 The line of rills along the road mark the edge of excavations in the gravel. 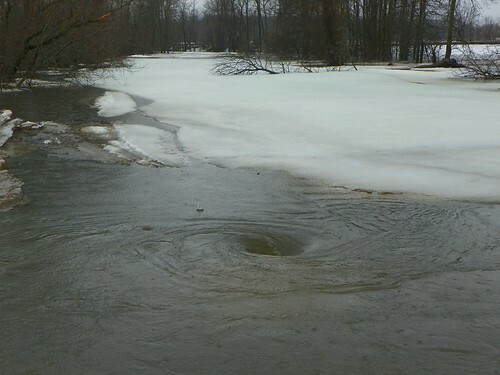 Whirlpools marked the spots where water was being sucked into the culverts below the surface. By Wednesday morning, the flow over the road had fallen to a trickle and we were able to survey the damage the water had done. Viewing the effects of just a few inches of water flowing over 24 hours gave me a much more visceral understanding of the forces that must have created the Grand Canyon! 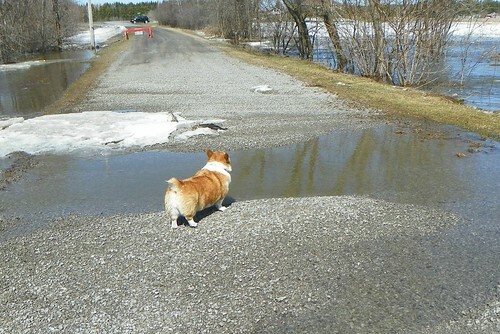 Here’s Pookie, looking over the main channel the flood grooved into the road, about a foot deep. 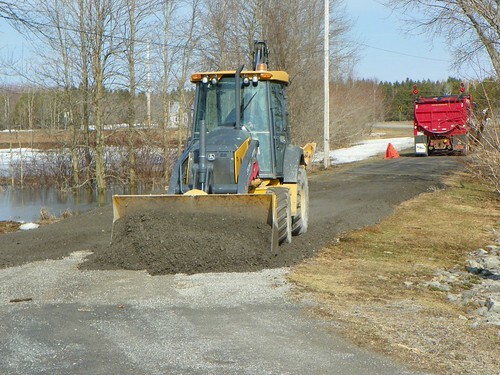 On Thursday morning, workers from the Township arrived with several loads of gravel and a tractor to repair the damage. It didn’t take them long to tidy things up and we were able to drive over the bridge again. 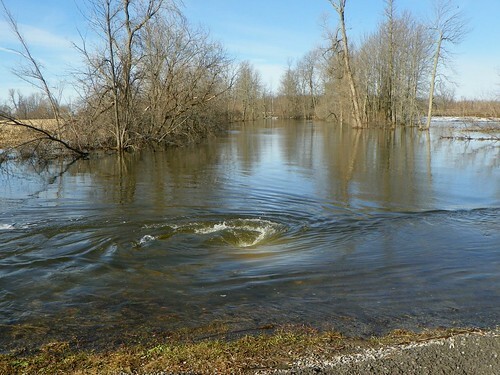 This Friday morning, the river is still flowing strongly, and is higher than the culverts, where whirlpools are still swirling. But it’s well below road level, and ice-free. Here’s a short video of the river in full flood on Tuesday afternoon. These days, there’s scarcely a retail store you can enter without being confronted with a collection bin for a local food bank. Even the LCBO has one! (The liquor store. Are they hoping for donations of beer? The poor could probably use one.) And every time I see a collection bin, I wince. It’s embarrassing. I feel so ashamed of us Canadians. Here we are, one of the most fortunate of nations, and yet we expect our poorest citizens to beg for food from strangers. The biggest problem with food banks is that they simply can’t meet the needs of the hungry. Many food banks are so overwhelmed that they must limit households to one hamper per month. The supplies they are able to provide do not insure users will have nutritious diets. Food banks can only supply what is donated, often canned and boxed goods, with few fresh items. Beyond feeding the hungry, food banks serve less conspicuous functions. Food banks unintentionally divide citizens into ‘Haves’, those who make donations, volunteer or participate in food drives, who can feel good about helping out, and the ‘Have Nots’, who may be demoralized at having to accept handouts. This reinforces an old charitable model, where one group of privileged people helps the underprivileged, perpetuating an us-and-them atmosphere. Food banks are good for corporations, especially food corporations, who may use food banks to offload edible food they can’t sell while advertising themselves as caring businesses. 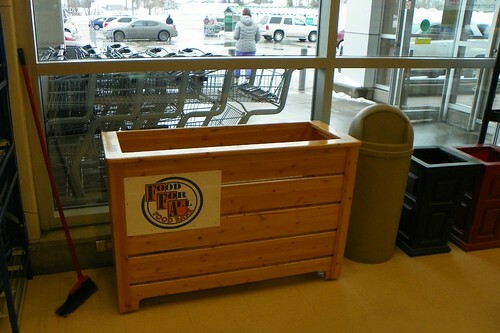 Grocery stores invite shoppers to buy extra supplies to donate in their collection bins. Some even offer pre-packaged bundles you can purchase for donation. Corporations may thus be content with the status quo. In providing a band-aid solution, food banks allow governments to sidestep their obligation to look after the well-being and security of all citizens. The failure of governments to deal with poverty has been a growing problem in Canada, with income inequality, the gap between the rich and the poor, increasing every year. In Ontario, 375,814 people were assisted by a food bank in March of 2013. Of those 35% were children. That compares to 314,258 in March of 2008, an increase of 19.6%. This is not a problem that is going away. (Numbers from Food Banks Canada’s report Hunger Count 2013, linked here. No one wants people to go hungry. That’s what prompted the establishment of food banks in the first place. But they were only ever intended as a strategy to hold things together until better solutions were found. Now here we are, decades later, and things haven’t improved. Food banks represent our failure as a just society. It’s time for governments to start tackling the real issue behind food banks: poverty. Thanks to daughter Seabrooke, who kindly volunteered to animal-sit for a couple of days last week, we were able to make a little jaunt out to the Bruce Peninsula to visit relatives. 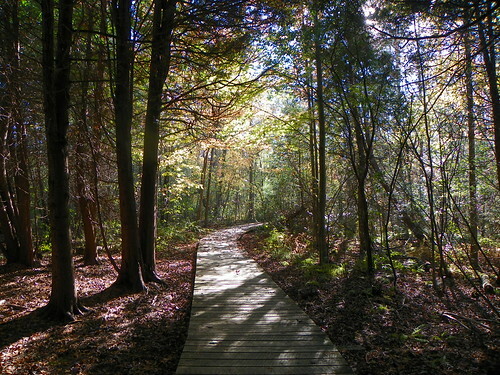 We followed a loop through Algonquin Park in the hope that we might be able to stop and do a bit of hiking. Alas, it was not to be. The sky was overcast when we left home, and by the time we reached Ottawa, it was raining. 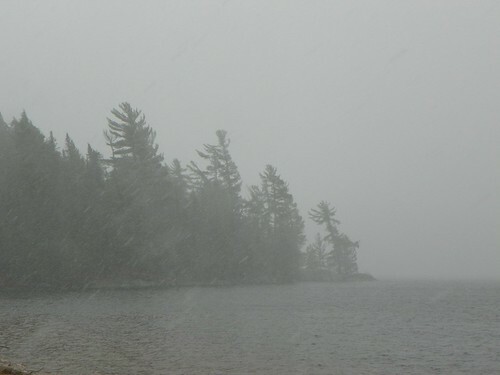 At the outskirts of Algonquin Park, the rain had become snow. 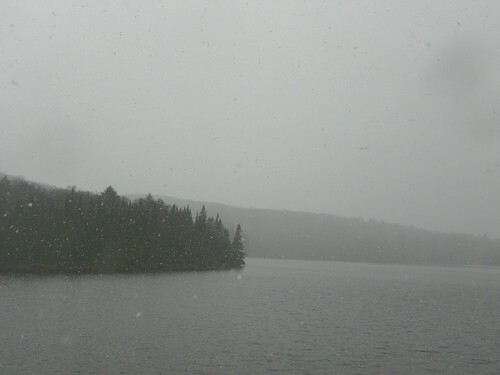 The weather deteriorated and we drove straight through to Huntsville on some sometimes slippery roads. We were glad to reach our hotel and settle in for the evening. 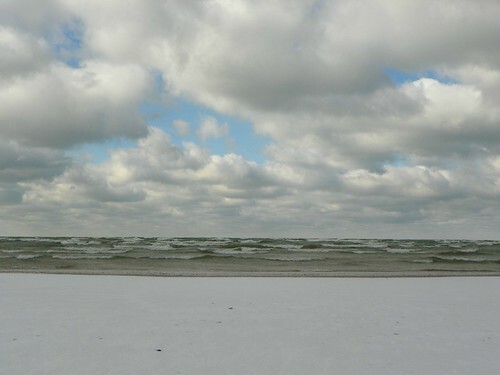 The morning brought better weather, but it was still cold, and the ground was covered in snow. Here’s the view from our hotel room over Fairy Lake, Huntsville. 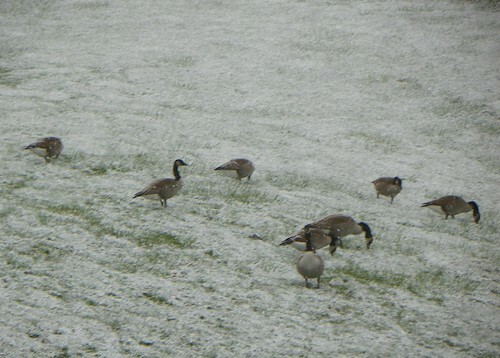 I enjoyed watching these geese foraging in the snow. 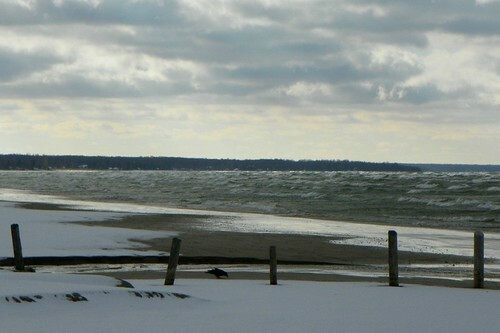 We continues on our way via the road that follows Georgian Bay from Wasaga Beach to Owen Sound. We stopped in Collingwood briefly so that I could take a few shots of the water. Wow! 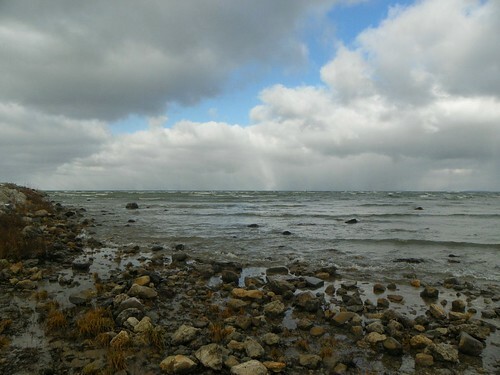 The wind blowing in from the water was icy cold. 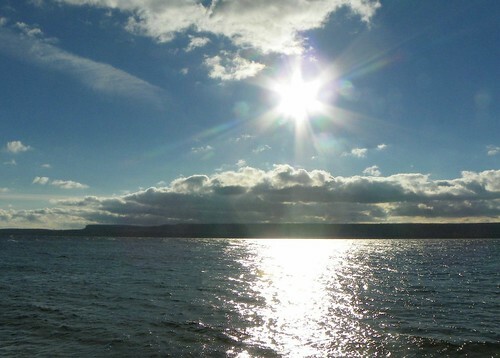 Later in the day, the sun triumphed and all in all, we had a pleasant drive out to Wiarton. 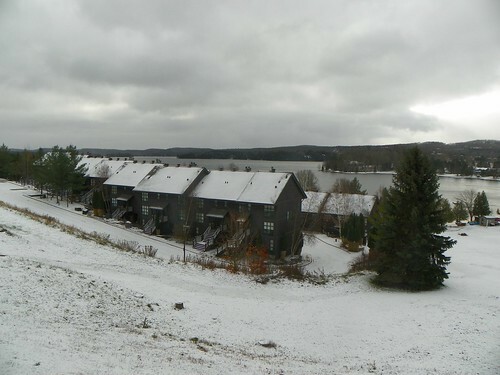 The next morning, we enjoyed the sun shining on Colpoy’s Bay. 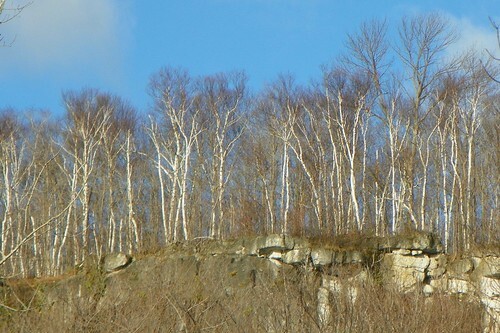 I like the way the trees line the edge of the Niagara Escarpment. 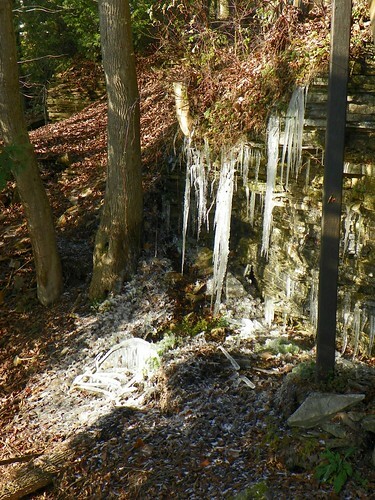 These icicles attest to the fact that, though the sun was shining, it was still cold. …before heading home the next day. 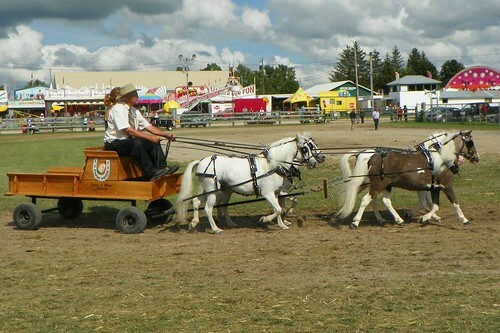 On the long weekend, we had some rain on Saturday and Monday, but Sunday was a beautiful day, and we took advantage of the good weather to attend the Perth Fair. 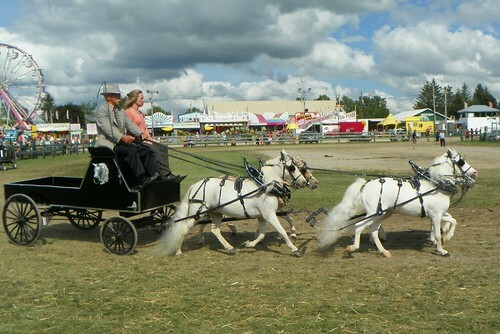 Over the years, we have been to most of the fairs in the area, but this was the first time we made it out to the Perth Fair. There’s always lots to see at a country fair. Most feature classes for various farm animals, sheep and cows and sometimes poultry and pets. 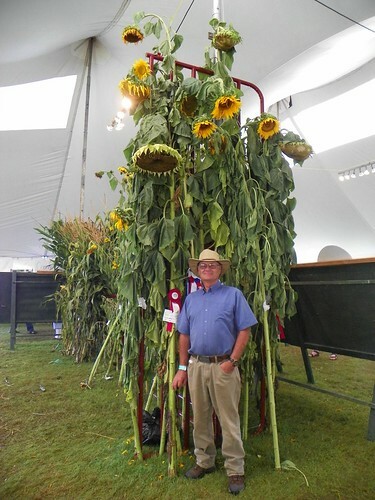 There are classes for the best vegetables, the biggest pumpkin, the tallest sunflower, the best hay. There are displays of handiwork and I like to look at the quilts. The skill and creativity always amazes me. 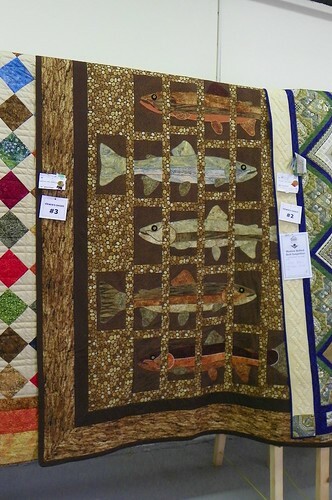 All the quilts were beautiful, but I especially liked this fishy design, a bit out of the ordinary as patterns go. 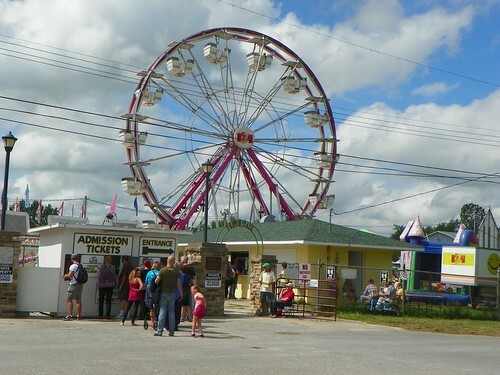 And of course there is a midway, with rides and games and lots and lots of booths featuring hot dogs and cotton candy. 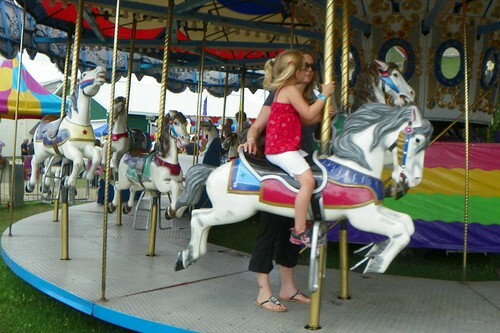 I like to check out the horses on the merry-go-round. These were well-maintained and pretty, but rather unimaginatively painted, with all the horses white. But it is the horse show that I enjoy the most. On Sunday, there were three separate events underway. 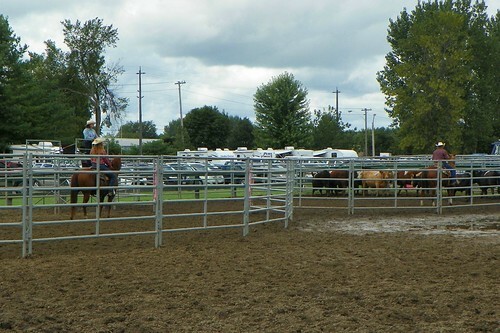 The Team Penning is held in a pair of circular rings joined by a gate. A herd of eight cows waits in one of the pens and each cow is numbered. 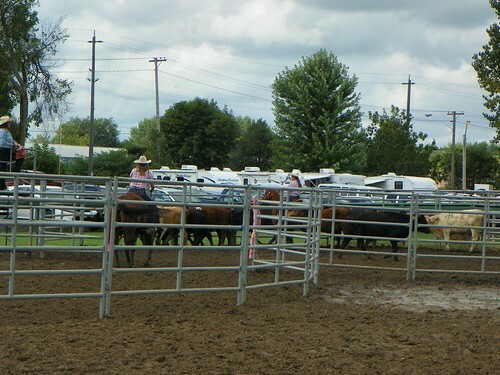 Pairs of riders wait at the gate and when the judge calls out the number of a cow, the team must separate that cow from its mates and move it into the empty pen. Additional cows must then be cut out and moved, in successive order from the first number called, with the goal of moving as many cows as possible in the correct order in 60 seconds. If a cow with a wrong number slips into the second pen, the team is disqualified. In another ring, an Obstacle Race attracted a lot of competitors. 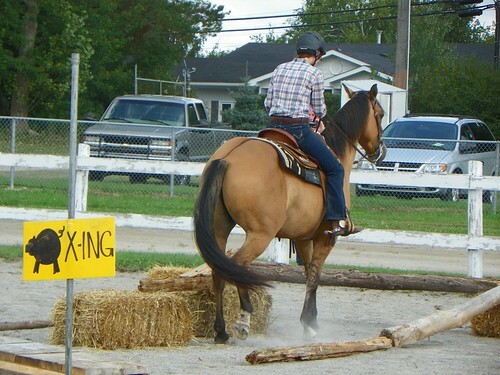 Each horse and rider is judged as they tackle a course of obstacles and tests. 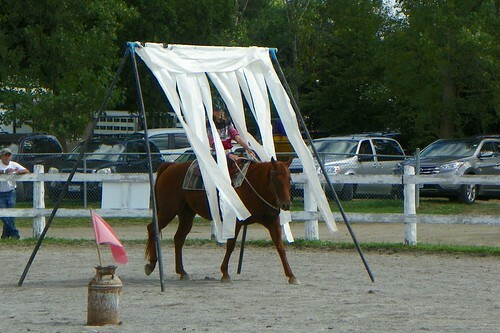 Above, a horse and rider walk through a screen of streamers. Horses have a very sensible aversion to stepping into or onto surfaces that might be dangerous, so crossing a hollow bridge can be scary. Horses had to back through a U-shaped pathway without dislodging the barriers. 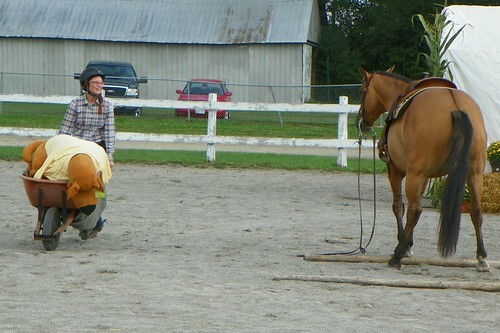 The horse is required to stand still and wait while his rider moves a wheelbarrow between two points. It’s fun to watch each horse’s reaction to each of the tests. Many did very well. 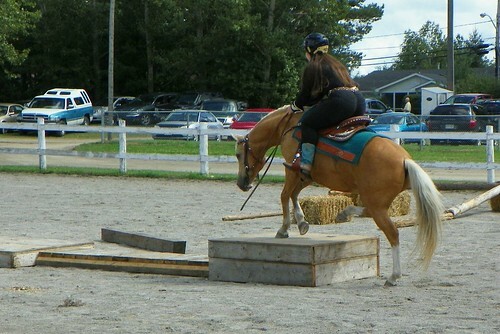 Others clearly thought that their riders showed a distinct lack of judgement. 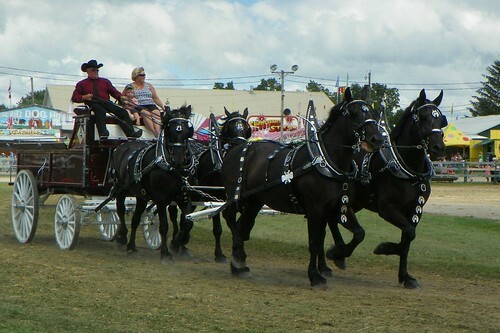 And then there was the harness show, that featured heavy draft horses, lighter commercial drafts, and miniature horses! The mix of classes allows competitors time between events to harness their teams. 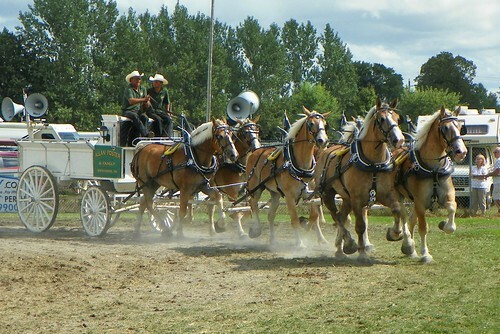 Here is a four-horse team of heavy draft horses. 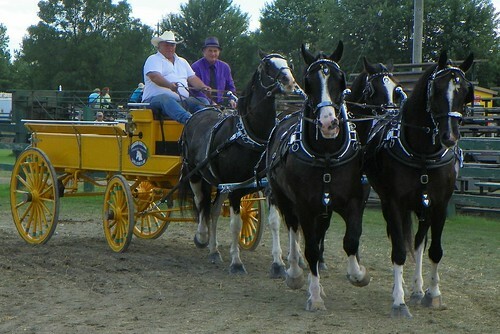 Here is an eye-catching four-horse entry in the commercial class for lighter draft horses. And here are the four-horse minis! It really was a pleasant day of horse-watching. 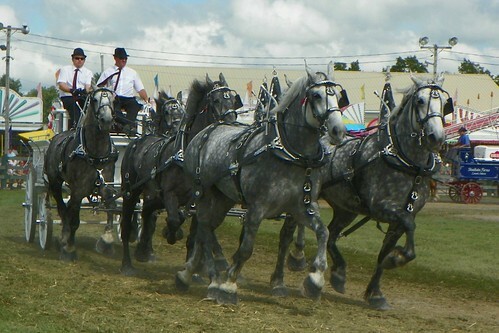 I’ll leave you with a couple of photos of the six-horse hitches, a very impressive sight indeed. I followed a round-about route home from Peterborough. It brought me through Marlbank, and I stopped by Dry Lake for a few minutes. It was very quiet and serenely peaceful. You’d never guess that this was once the site of a large factory employing 200 people. There are a number of short histories of the town of Marlbank to be found online, varying slightly in their details. The local soil type, marl, determined much of its early development. 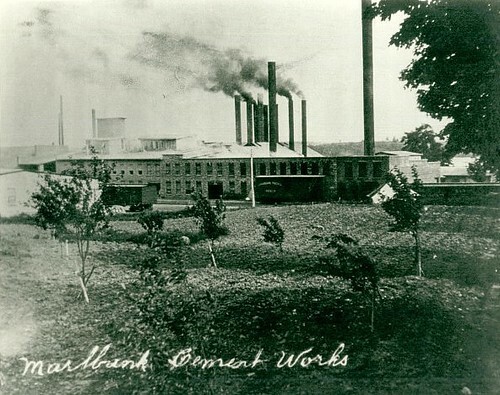 The marl was ideal for making Portland cement, and in 1891 the first cement factory was opened. It conducted business under various names until it closed its doors in 1914. At its height, the factory employed 200 people and supported a busy town. Explanations for the closure of the factory vary, but Marlbank supplied some of the cement used in the construction of the Panama Canal. Perhaps demand for cement fell after the completion of the Panama Canal in 1914, and more remote and thus less economical operations were forced out of business. A few remains of the old buildings can still be seen as they succumb to new forest growth. 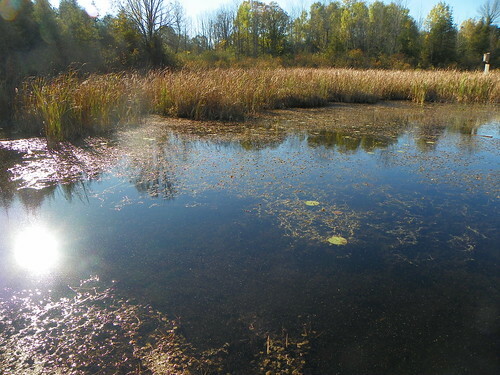 The area from which the marl was dredged now forms Dry Lake. 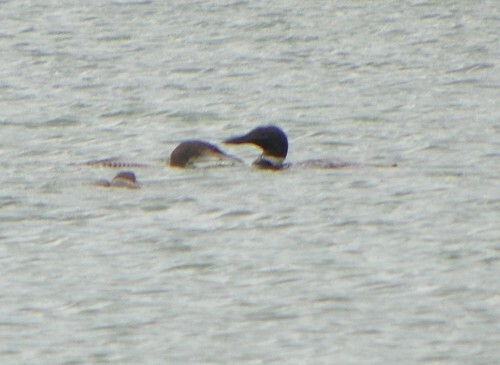 When I stopped, there was a family of loons close to shore. 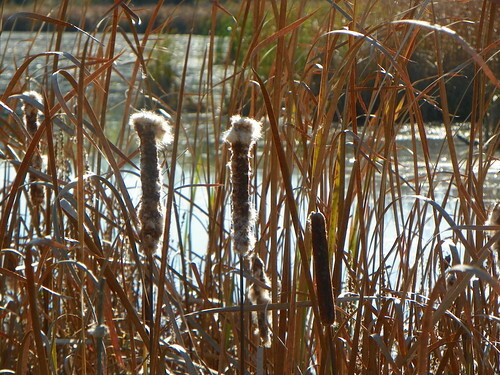 They quickly retreated and I was only able to get a distant shot. Still, I was pleased to think that they were now the beneficiaries of that long-ago human enterprise.